Welcome to the March Pinterest Challenge Blog Hop, hosted by My Pinterventures. The purpose of this Pinterest Challenge is to motivate all the participants of this hop (and you too) to not just pin, but to make it happen! 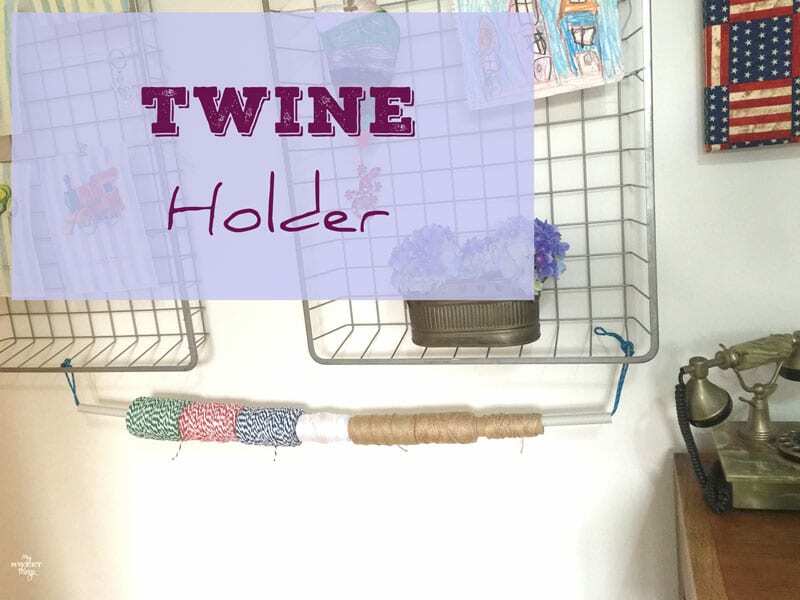 So this month, I chose to try my own kitchen makeover!! 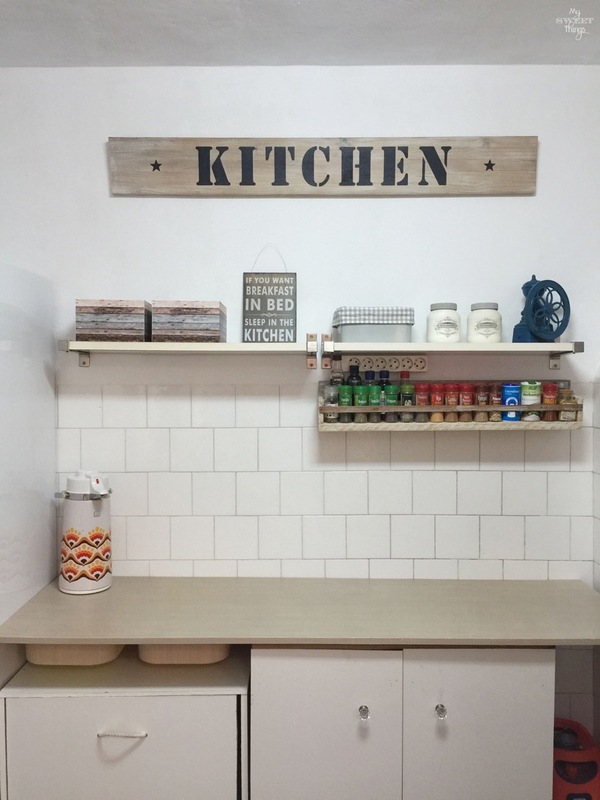 You already would have read all my blog post series of tips we have learned in our process of renovating/updating our home, like the hassle-free kitchen renovation I shared last week. But as promised, I still had to share the process and the pictures so here they are. We started with this kitchen. Not too good, right? The good thing about it is that it had those cool tiles. They are vintage but trendy again. 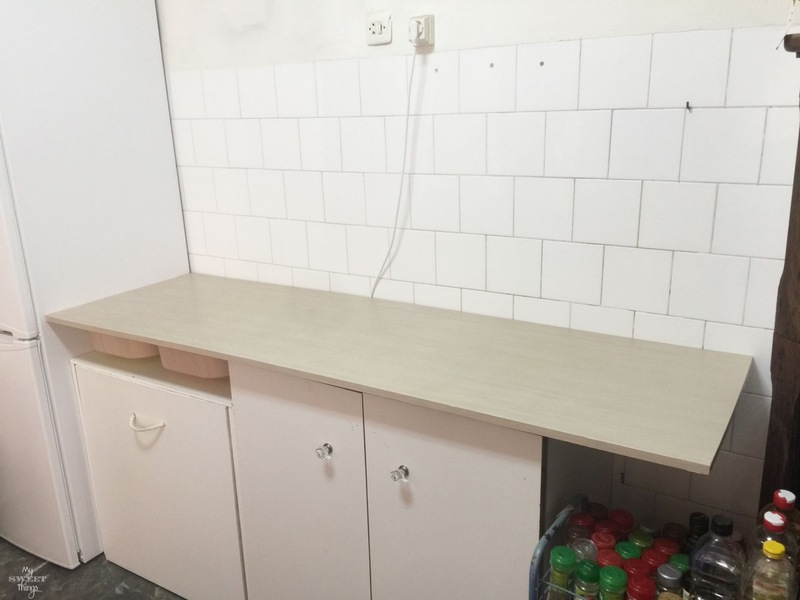 It is not small but there was a lack on kitchen cabinets and storage. I draw what I wanted it to be, and it had to be cheap because we are renting and covering the expenses, so it had to be really cheap! I will add some affiliate links for your convenience, you can read my full disclosure here. First I took and old cabinet and glued and nailed white plywood on the doors, and two beautiful glass knobs similar to these. Then I built a rolling cart that would hold the trash. We recycle so hubby was in charge of making the boxes for glass, paper, plastic and waste. Organic goes to our compost bin, I talked about it here. I added a piece of rope to pull it. I had in my wood pile a piece of wood I found curbside and that happened to be the perfect deep for a countertop. I just needed to cut it because it was too long, and added contact paper to match the rest. Can you see all our species cluttered in a rolling cart? Yes, I still had to work on that. 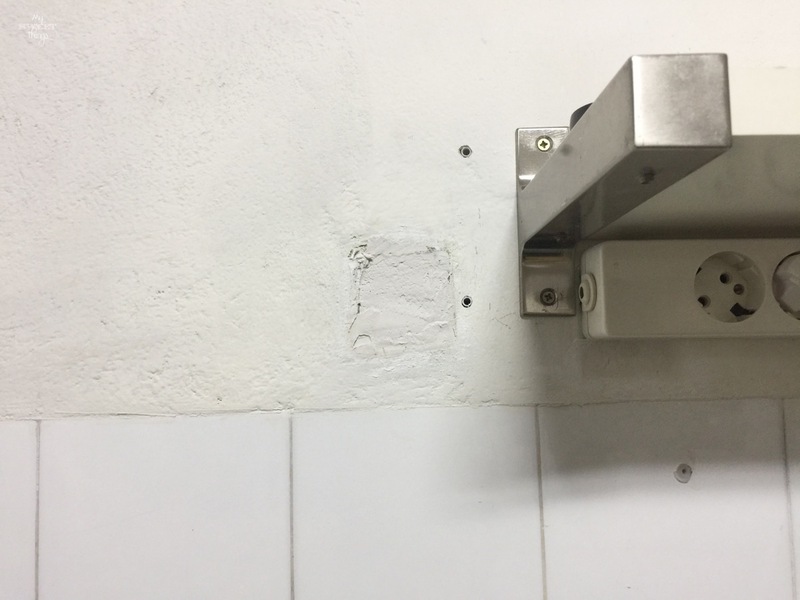 The wall had an old socket which was not working, and the other one wasn’t enough for all the appliances we normally use when cooking. Here it came hubby to the rescue. Excuse me, but I don’t mess with electricity, I am not that brave yet. 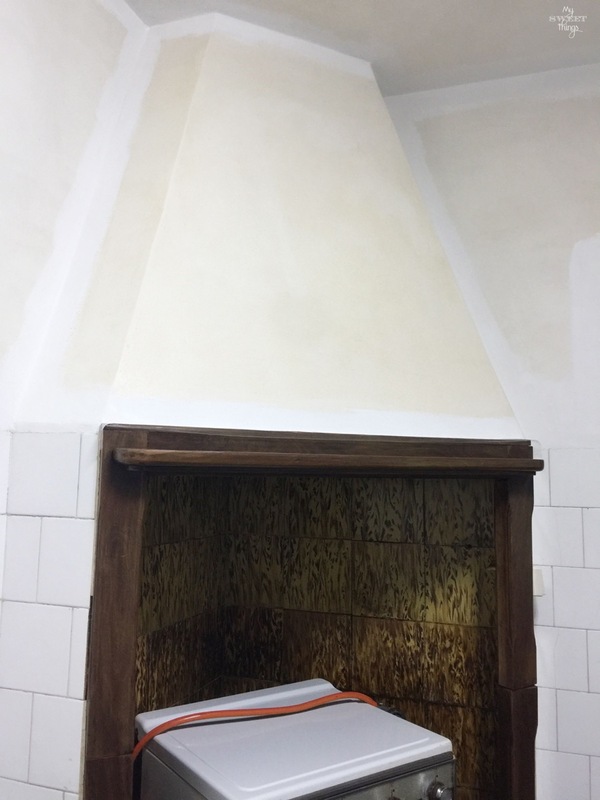 My only job here was to put some plaster on the wall to hide the hole of the old socket, and tell my husband where I wanted the shelves. 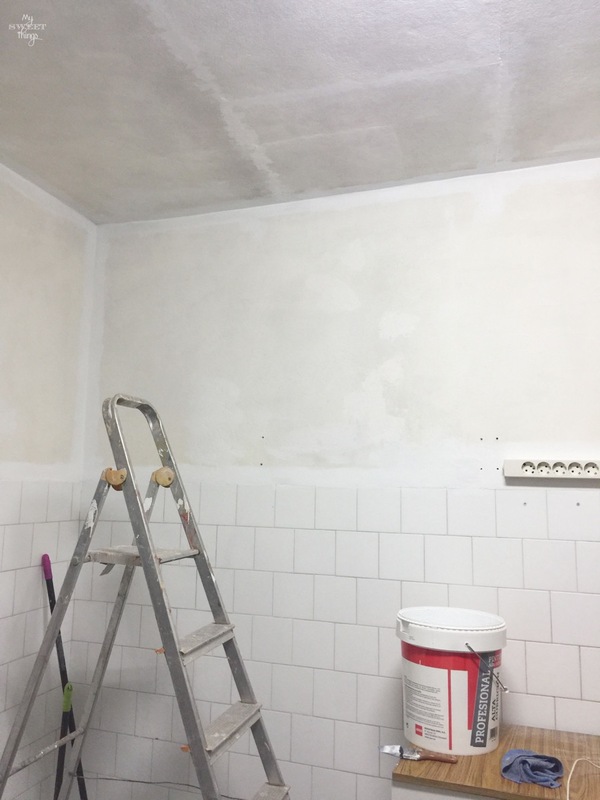 Oh, and to fix some cracks on the ceiling because I was ready to paint. 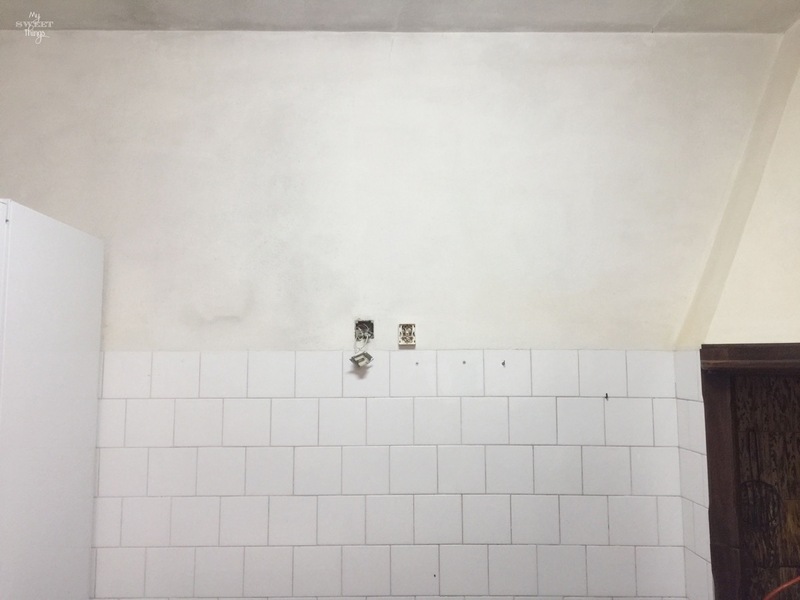 If you love to paint walls and ceilings as much as I do (read: nothing), then I have good news for you. I have a secret weapon. Ta-da!! Here’s my secret weapon! 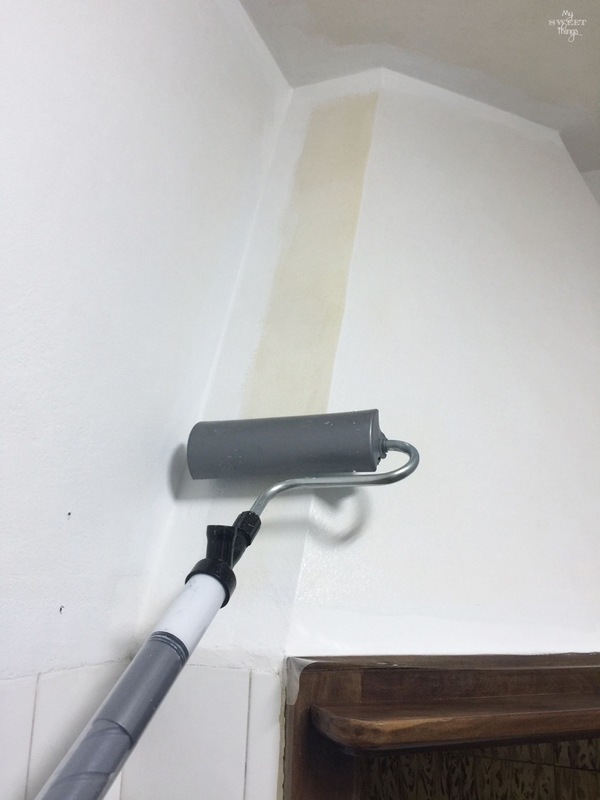 My PaintStick EZ-Twist paint roller makes painting fast and easy as a breeze. It is like a huge syringe which holds the paint inside and just twist the handle while you roll. It saves you from the back-bending work of constantly going back and forth to refill on paint, and no drips. 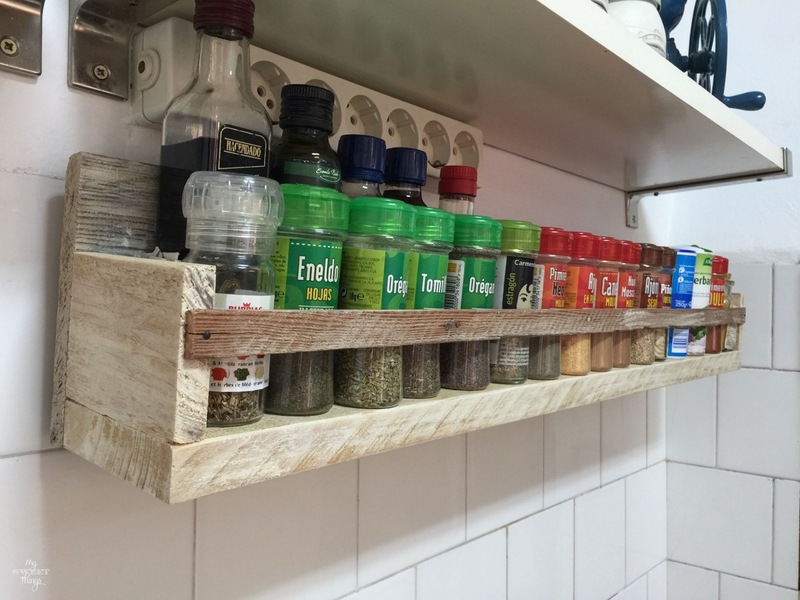 While the paint was drying, I build a spice rack to hold all our spices with some scrap wood I had. 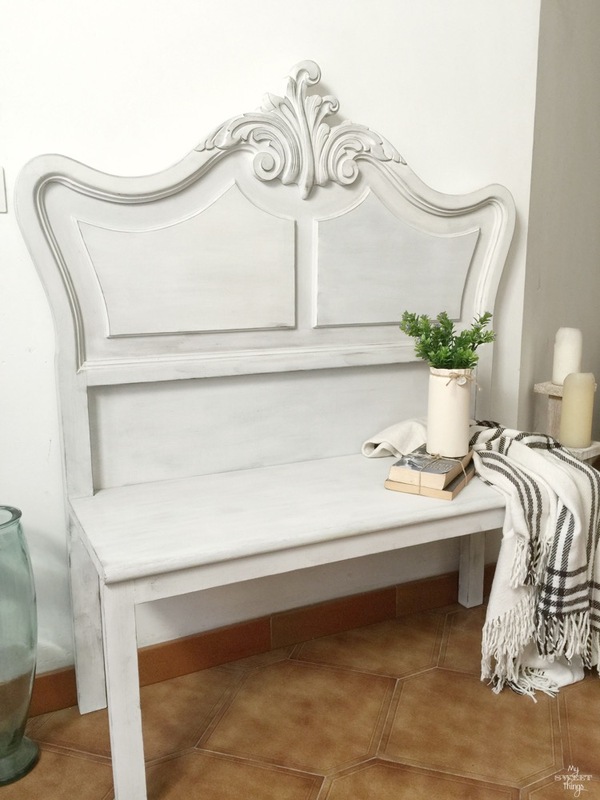 I weathered it to give it a farmhouse look; if you want to know how I did it you can read my post on how to weather wood. It’s a big one because we have lots of spices! 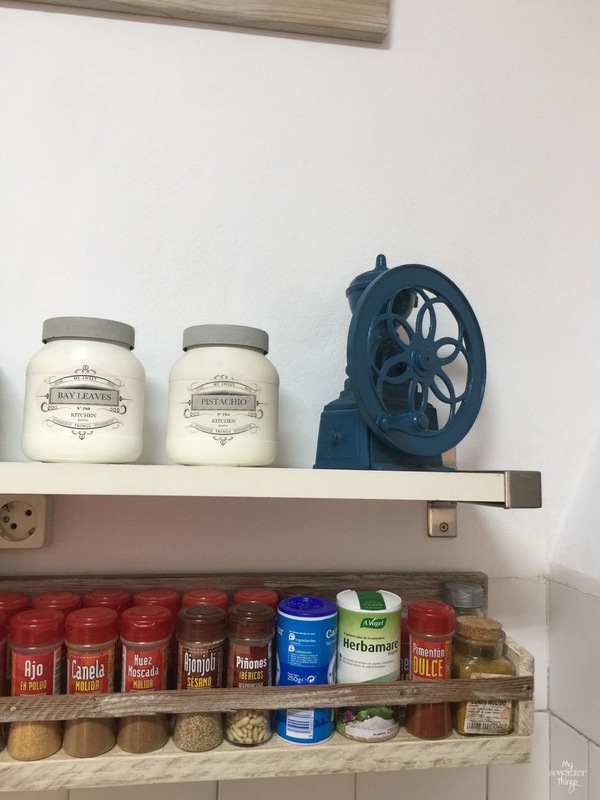 The old coffee grinder is a gift from my mom, I remember my dad painting it blue when I was a kid. I made this basket out of a plastic paint bucket, it only needed some paint and a piece of fabric. Don’t tell me it’s not cool! 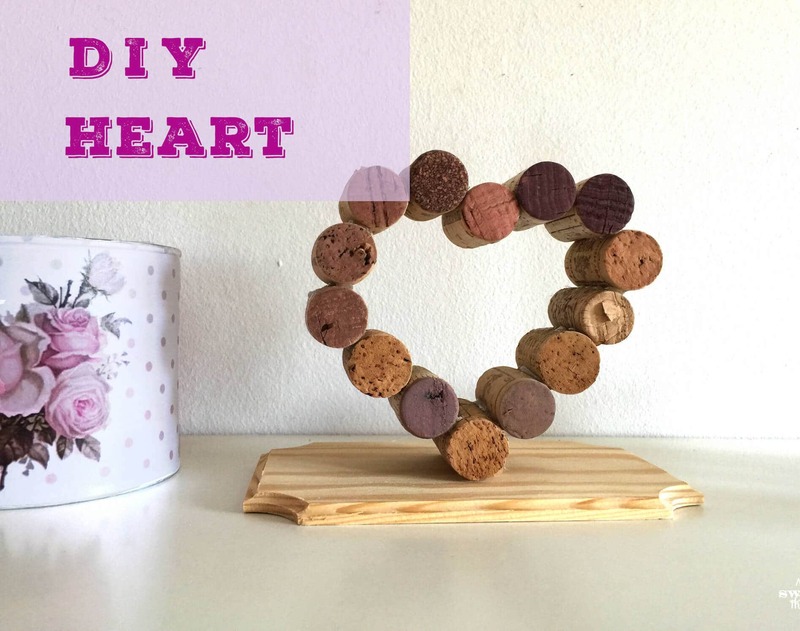 And if you like the jars you can read how I made the pantry storage jars here. The white walls make the kitchen feel clean. I also made these boxes with some scrap wood and decoupaged paper on them. 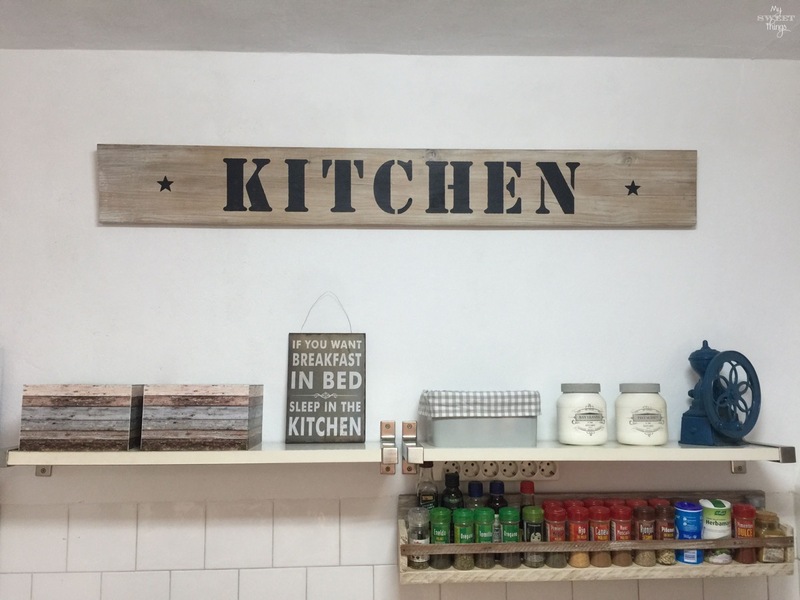 But my favorite is the KITCHEN sign I made with (guess what?) more scrap wood. But the kitchen wasn’t ready yet. Can you remember what’s missing? Paint them, of course… what else? I used a special tile paint which was a leftover from a bathroom makeover I was doing for a client. 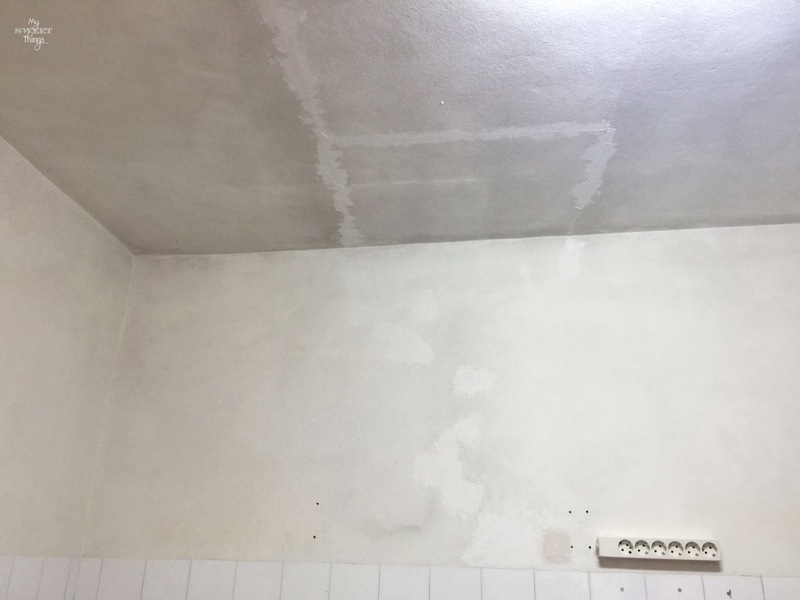 You can see how to update a bathroom easily. I used a good foam roller to paint, that’s the key to a great finish. And I like to paint between tiles first, I find it looks much better. Oh, and I forgot to show you a little extra storage for the kitchen towels. They are above the trash cart, suspended from the countertop. Here you will find the tutorial for the floating under counter storage bins. Finally, the kitchen was done. It has our personality, it’s made out of bits and pieces but still looks nice. We love collecting magnets from the places we visit and placing them on the fridge. It is now a kitchen seasoned with love. 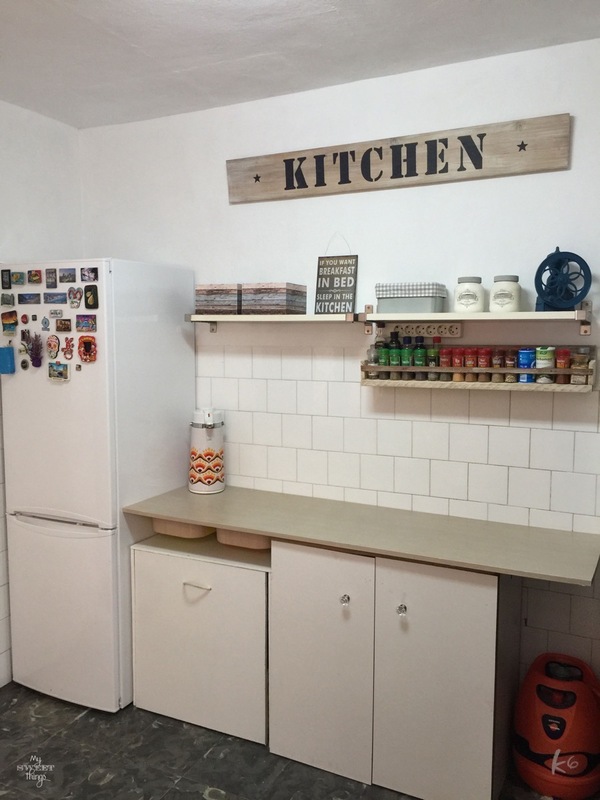 I hope you like our kitchen makeover, we sure love it and now we can delete another thing from our long to-do list. If you feel like sharing it, feel free to do it! 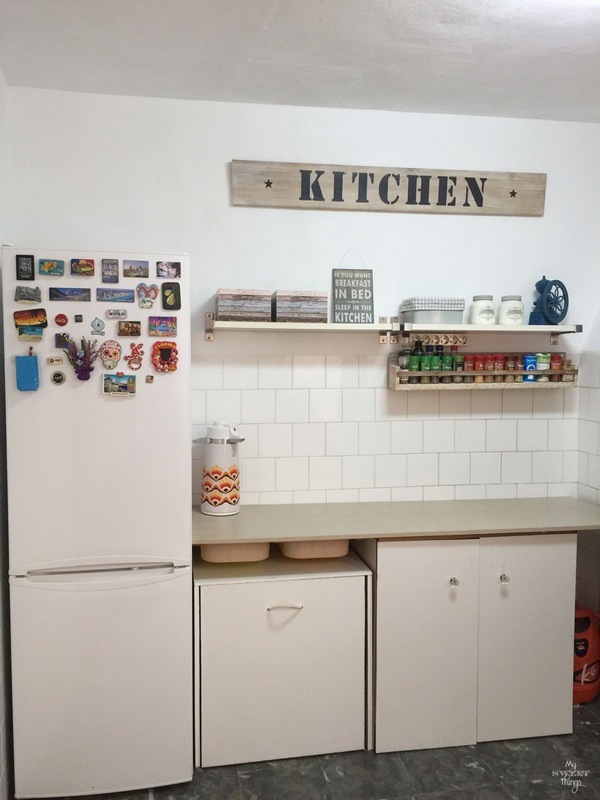 This entry was posted in Before & After and tagged Kitchen, Makeover. 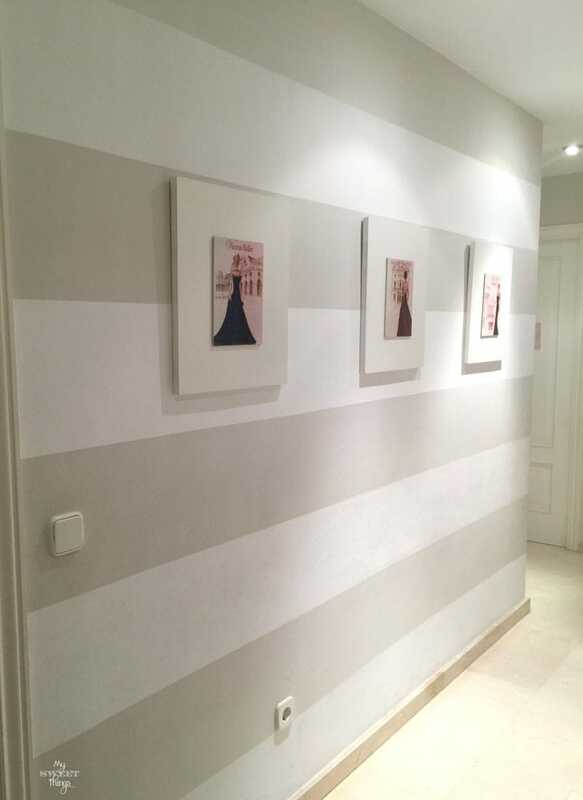 Nicely done makeover, I especially like that you were able to do all this in a rental, very creative. Pili this is indeed a kitchen that is filled with love and lots of personality. I love how it reflects who you are and what is important to you. All those pretty items that are handed down-from your family and the spices really tell me a lot about you. 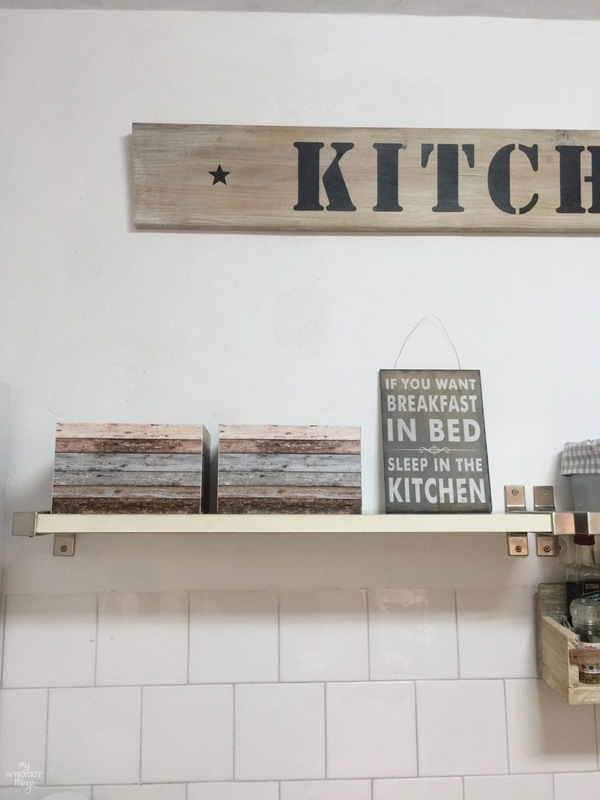 And what can I say about those signs they are perfect for your kitchen. I’ll definitely have to check out that brush cause I am doing way too much painting these days and not enjoying the ceiling part at all. Thank you Mary. Seeing it in a post seems it’s been done in a breeze but the house was a chaos for a while. Now we are happy we did it, because we love to cook and we have room for all the things we need. If you need to paint walls I really recommend you check out that roller, you will see a huge difference in effort. This whole post is filled with so many great ideas! I had no idea that they made tile paint so you could paint over old/ugly tiles and I just love your kitchen sign. Pinned! Thank you! That paint is so convenient, you can change anything without spending a ton of money. 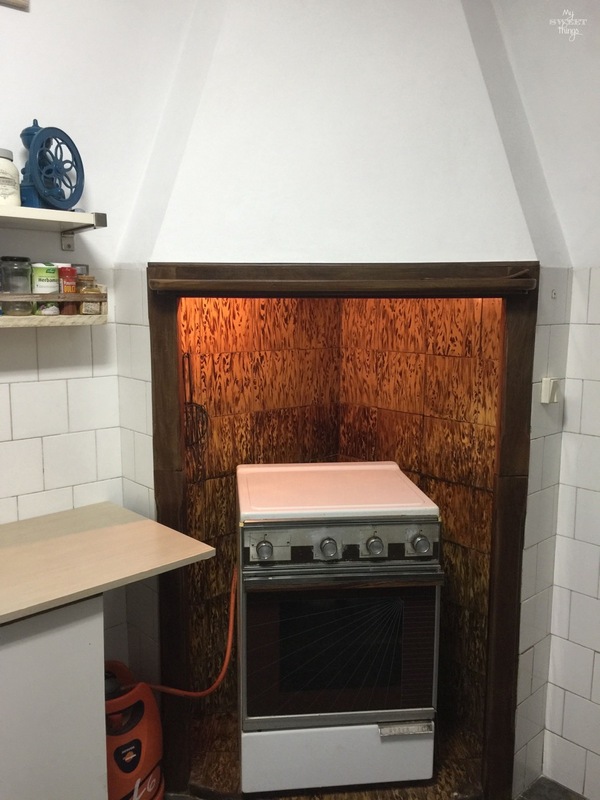 What fantastic difference all your great projects made in your kitchen. Love every one of them, specially your spice rack. Must feelgreat to have a “new” spiffied up kitchen. I have got to get one of those painting sticks, have heard of them for long time, but Mr..Furry always talked me out of getting one. No,more.With arthritis in shoulders, wrists,hands,back this is what I need to do painting. Has been many years other rooms still need painting since we bought our single wide manufactured home. If I don’t do painting will never get done. Tired of waiting for husband to get started. You have sure inspired me to iget to it finally. 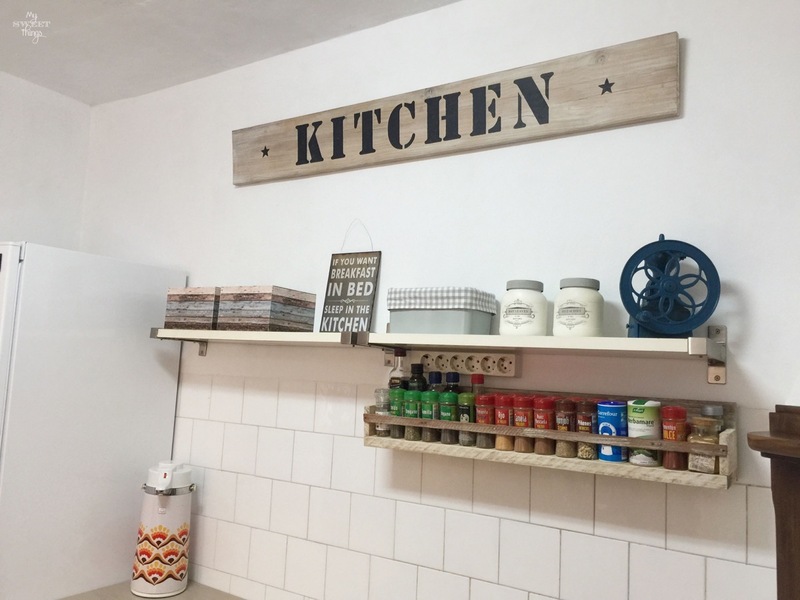 Yes, we feel great having a kitchen to cook together as a family, and it’s practical because we got rid of stuff we weren’t using and only kept the basic things. Painting walls is not a wonderful thing to do, but when you need to do it, it’s better to have things that make your life easier. I do the same, I get impatient waiting for my husband to do things so I end up doing them myself. That roller is awesome and I need to get one. 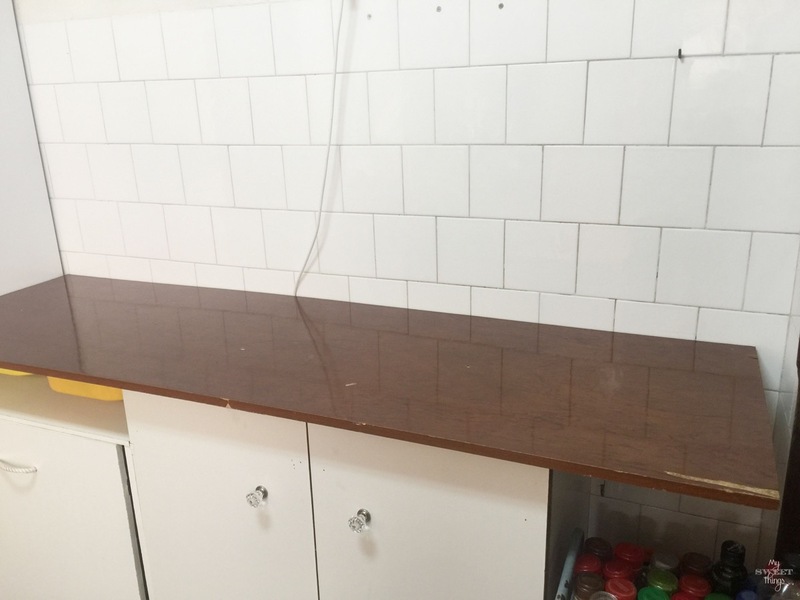 We are giving our kitchen a makeover and it looks so much easier. 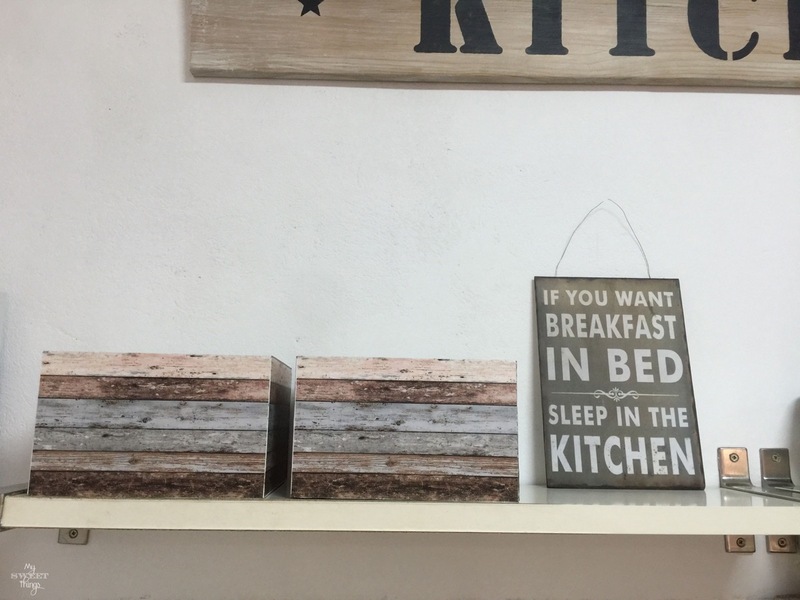 I love all of your ideas, the Kitchen sign is my favorite. Pinning! 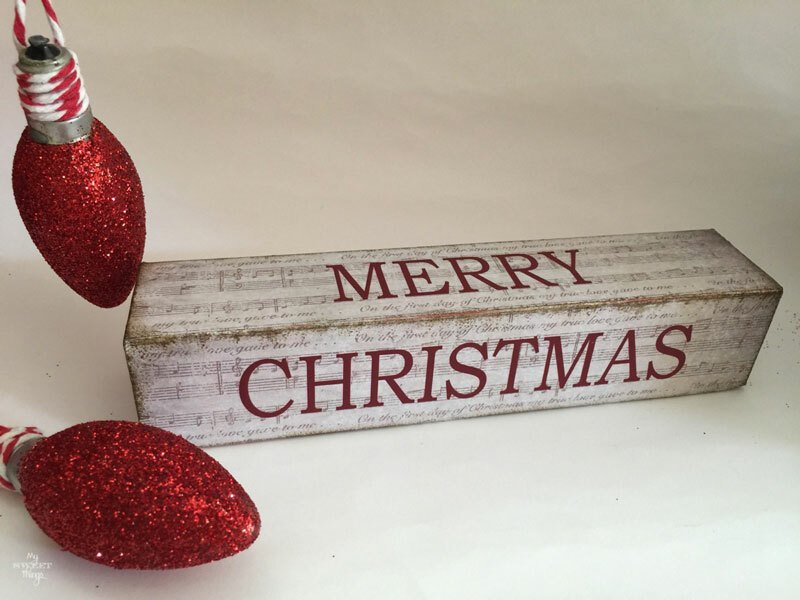 Thank you Jenny, the sign is my favorite too because it adds some charm to the space. The paint roller is a life saver, I tell you! You did a great job! Storage is always a necessity, especially in the kitchen. That turned out really well. Great job! 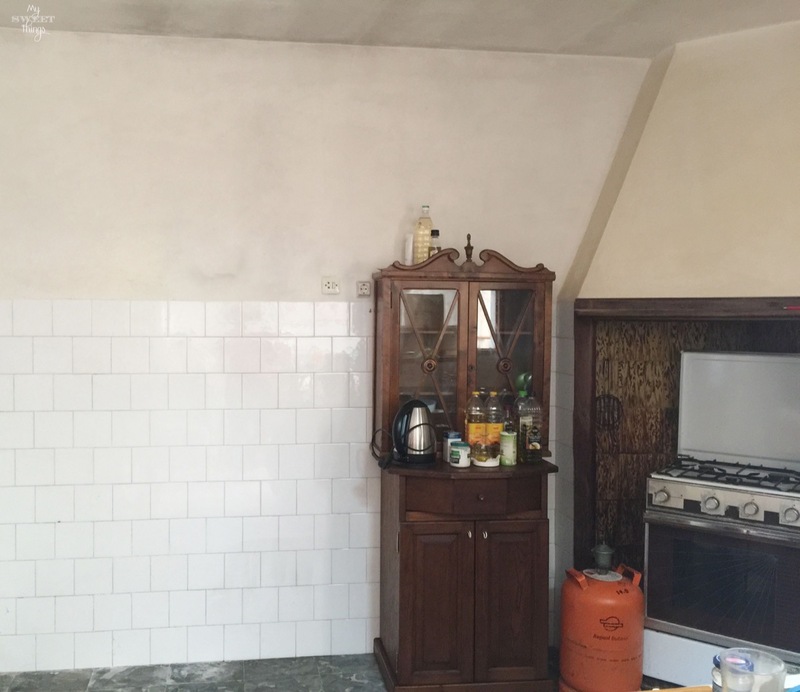 What a fabulous job you did giving your kitchen a face lift. Love the little boxes and decor on your shelf. 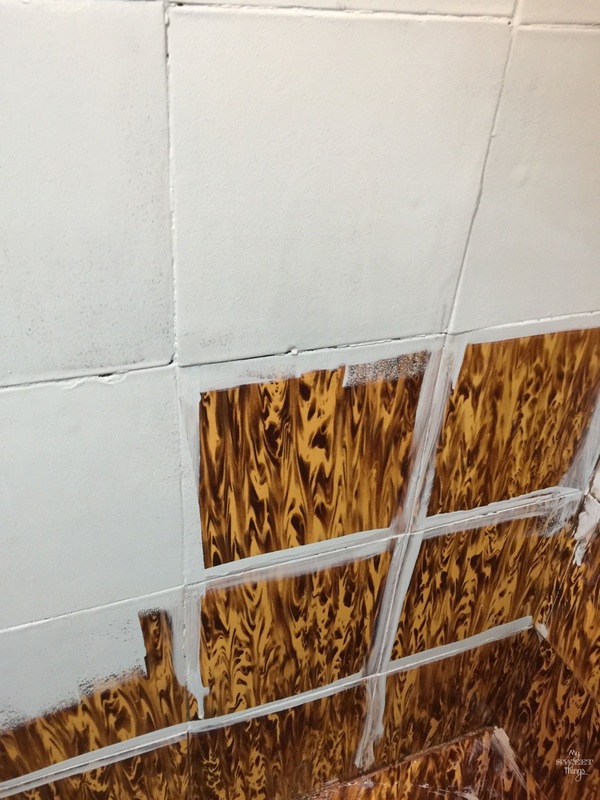 Amazing how different the wood tiles look after you painted them. Bravo! Que bella! Oh my word Pili. I’m gobsmacked with all the work and effort you’ve put into your kitchen. It’s so much different to the before and it make it so much more special knowing that everything was done by hand. No big, expensive contractors. You guys are amazing and so inspiring. P.S. I really, really need to get me one of those rollers. I need to get me one of those paint sticks, such a time saver! You did a fantastic job in painting your kithen and giving it a new look. So many small project that make up the final look. You guys did a great job. I love your Kitchen seasoned with love! 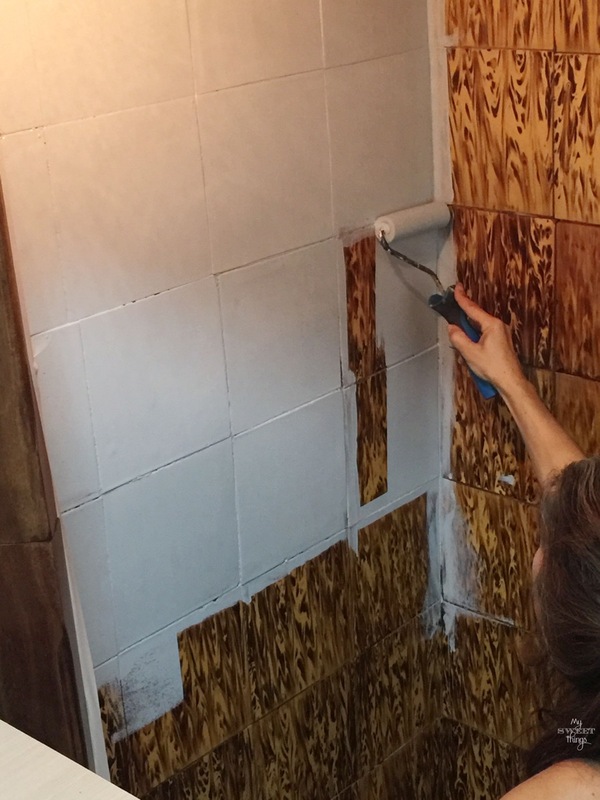 Wow, such a transformation and I need to get the tile paint Pili! 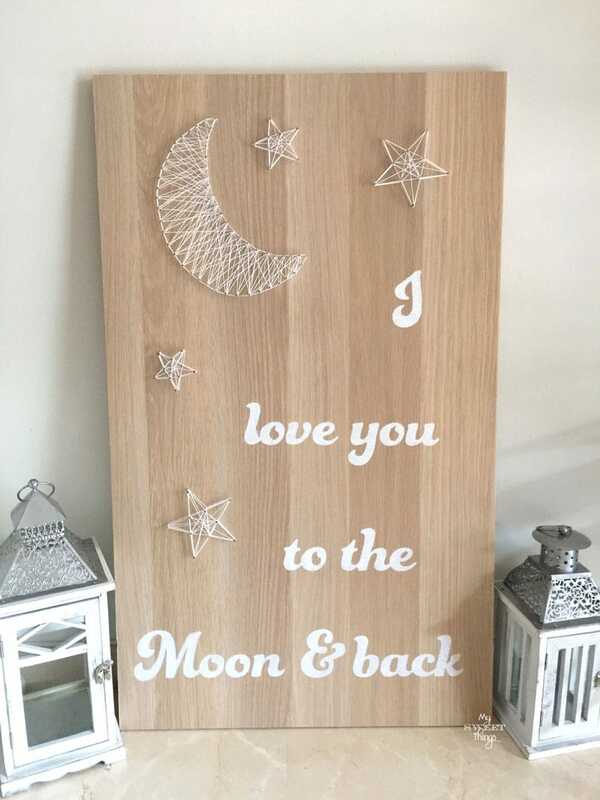 Love your creativity and the signs give it all some personality! The kitchen is so amazing. What vision you have. All of your hard work paid off. 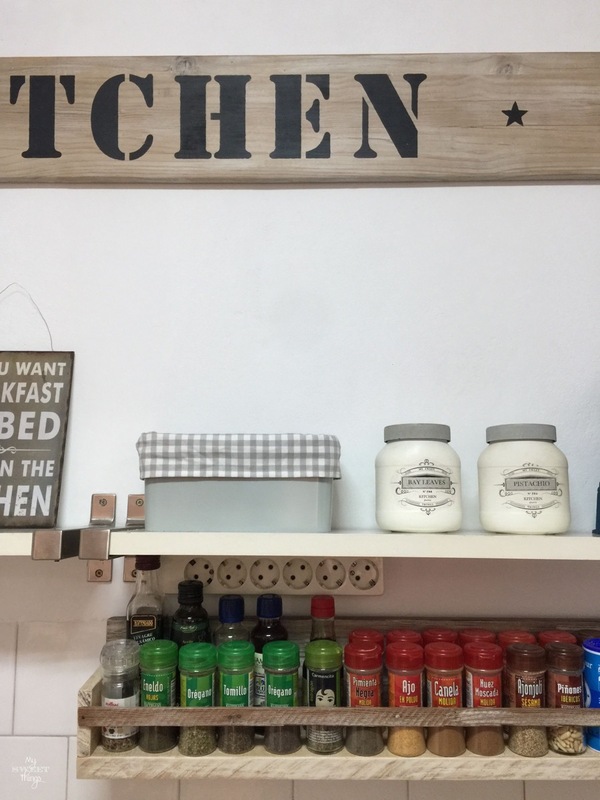 Pili, your kitchen makeover looks wonderful!! 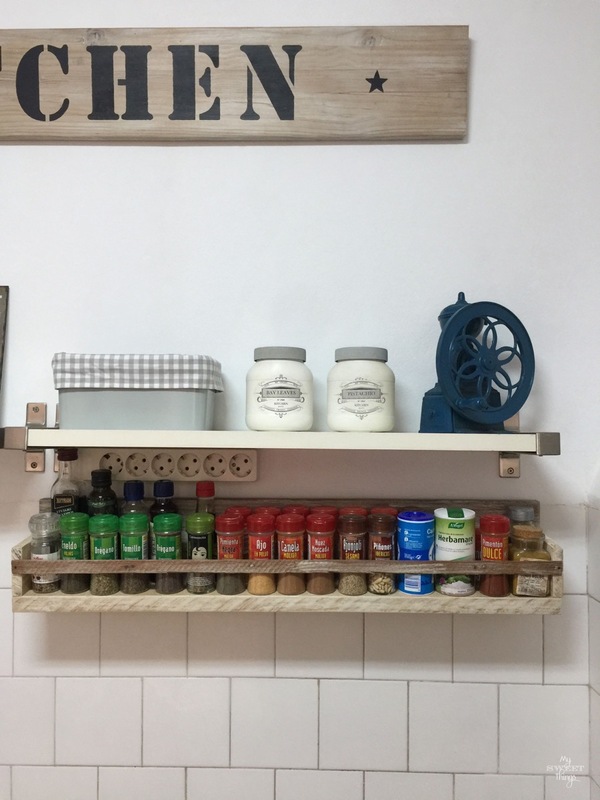 I really like the spice rack and the kitchen sign! 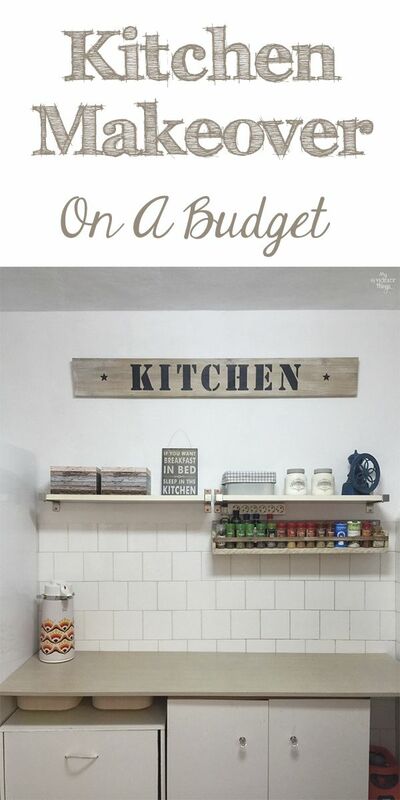 You and your husband did a fantastic job on all the details of your kitchen makeover.